The announcement was made after air raids targeted the part of southern Ghouta under the control of the Faylaq al-Rahman rebel group. Beirut, Lebanon: A Syrian rebel group which still controls a pocket of the Eastern Ghouta enclave on Thursday announced a ceasefire from midnight to allow negotiations with the regime's ally Russia, a spokesman for the faction said. 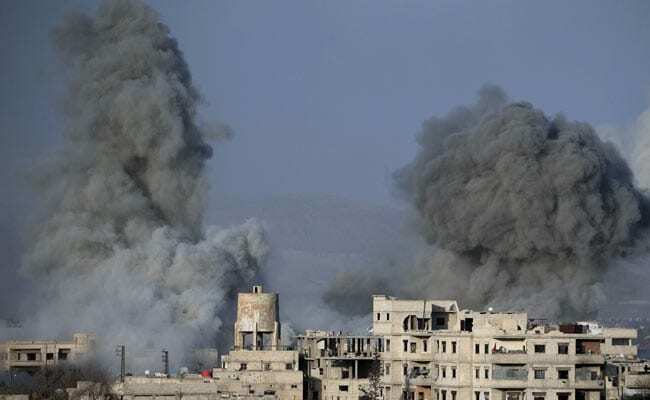 The announcement was made after air raids targeted the part of southern Ghouta under the control of the Faylaq al-Rahman rebel group, leaving at least 38 people dead, according to the Syrian Observatory for Human Rights. The ceasefire move also came as the first evacuations of rebels and civilians took place in Eastern Ghouta under a Russian-brokered deal that is the first for the shrinking opposition enclave outside Damascus. The evacuation deal further isolated the rebel groups that control the remaining two pockets of Ghouta and piles pressure on them to accept similar deals. The regime of Syrian President Bashar al-Assad, backed by Moscow, last month launched an offensive which allowed it to take back more than 80 percent of Ghouta, the last bastion of the rebels in the area. The regime's offensive on Ghouta has killed more than 1,500 civilians since February 18, the Observatory says. Central Damascus lies within mortar range of Ghouta, and the evacuation deal came after the deadliest rebel rocket attack on the capital in months killed 44 civilians on Tuesday. A Faylaq al-Rahman spokesman in the southern rebel pocket of Ghouta announced that "agreement has been reached for a ceasefire, through the auspices of the United Nations". The truce will permit "a final round of negotiations" between a local rebel delegation and Russia to find a solution "guaranteeing the safety of civilians and an end to their suffering and guaranteeing an end to this war and the bombardments," he added. The Syrian Observatory blamed the 38 deaths on Thursday on Russian air strikes.